In the 24 to 48 hours before a migraine, you may experience flashes of light, tingling up and down your face, arms, and legs, and other conditions that seem to have nothing to do with your head, like GI distress. Some migraines are secondary to other conditions. Don’t wait to get care if you’re also experiencing numbness, fever, or confusion. If you’ve had some of the symptoms mentioned above for at least 15 days each month for at least the past three months, your migraines are considered chronic. 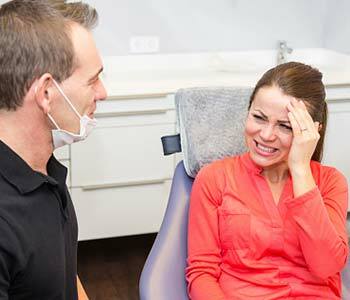 HOW CAN DENTISTRY HELP ME FEEL BETTER? Teeth-grinding and clenching are triggers. Dr. Levenson’s custom-made stabilization appliances or night-guards prevent you from clenching or grinding in your sleep. They also help protect your teeth from inevitable wear and tear. Unlike DIY solutions that may make clenching worse, these appliances properly fit your mouth for effective prevention and protection. Obstructive sleep apnea is another night-time condition that may be to blame, especially when you consider nearly half of all migraines occur between 4 a.m. and 9 a.m. Lack of quality sleep and excessive fatigue are triggers, and patients with OSA tend to suffer from these problems because their airway becomes blocked during sleep. With accurate diagnosis, Dr. Levenson may recommend a comfortable dental appliance as an alternative to the bulky, noisy CPAP machine. Sleep apnea devices reposition your jaw, so you breathe unimpeded through the night. You may also find relief from treating other conditions, such as bite problems.